Bushfire by Elizabeth Mellor, a reflection of loss, a celebration of life and a book that heals. Having first hand experience of the terror of a bushfire in 2002, Elizabeth writes with truth and detail that takes the reader within the life of Ruby, her family and their hardship and joys. It all starts on a hot sultry day as Ruby sits under the peppercorn tree with her dog Gypsy. Ruby lives on a property out of town with her mother and her father. Life is soon to change as a bushfire rages across their property. With howling winds, fireballs landing in trees and heat that is described as 'sitting in the middle of a furnace', there is no time for this family to stop as they defend their property and protect themselves against the forces of nature. Ruby hates wearing all the clothing that her parents insist will protect her from the fire but she does not complain. With her lungs filled with smoke and her eyes stinging she unites as a team, with her parents,searching the house for amber's and distinguishing them before fire takes hold. There is little time for the family to stop and no time for sleep as the fire rages through the property. From the heat and fear of the fire the journey continues as reality sets in and the family are left to clean up the mess left behind and sort out their lives. For days they are alone on their property, with little supplies, left wondering if they where the only lucky ones and hoping that their friends and neighbours are alright. Ruby and her parents, along with Gypsy, soon find themselves amongst others within the community in a camp set up at the local cricket ground. It is here the reader meets the many different characters of the town and is taken on a journey of the affects that the devastation of fire can have on different people. With the use of descriptive detail and emotional statements Elizabeth takes the reader on a journey of heartache and loss, fear and pain but also of joy and elation, mateship and unity. She shows the true meaning of friendship and of community as all work together to help each other get through a time of hardship. During her time at the cricket ground Ruby meets up with many of her school friends but worries of the whereabouts of her best friend and next door neighbour, Joe. It is not until she goes back to school that she learns, within the playground, of the loss of her friend. This loss is not only felt by Ruby but also by her parents who, over the years, had formed a close friendship with Joe's family. Together Ruby and her family cope with the loss, joining together to remember their friends, the good times they had and returning to the remains of the house where they perished. The ending of Bushfire is one that leaves the reader feeling an immense loss but also the joy of the celebration of survival and the rebirth of nature. Six months after the devastation Ruby and her parents organise a barbecue for the community at their property. Here they hold a memorial for those friends and family that passed, grieving together, supporting each other. Each takes turns to read the name of a deceased and light a candle in their memory. Tears flow but everyone understands, 'the relief of grieving together was huge'. Finally there were the celebrations. Celebrations of a new life, new friends, new beginnings. 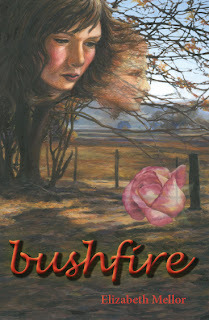 Elizabeth Mellor has done a wonderful job with Bushfire. She has used her life experience combined with her experiences as a qualified social worker and counselor to weave magic into a topic that is often difficult to approach and explain to children. In the early chapters of the book Elizabeth cleverly describes the actions to be taken in the event of a fire and precautions to take to prevent disaster if a fire should hit. In Chapter 2 the reader is introduced to the wearing of fire safe clothing as Ruby and her family dress in their fire gear which includes woolen socks, jeans and long sleeved heavy cotton shirts, they place on their cotton hat and grab their face masks. It is in this chapter that Ruby is given the task of making sure all the windows and curtains are closed and wet towels are placed against all of the outside doors. In Chapter 3, Fire Storm,the reader is introduced to the onslaught of the raging fire. It is here that Jack, Ruby's father, addresses the family describing tasks that must be done to protect themselves and the house. He talks of checking to see that blankets and towels are in the bath, of grabbing buckets and filling them with water and patrolling the house for sparks. Bushfire takes children through the steps of a fire plan, prevention and defense, in a non threatening manner. It is a book that should be read in all classrooms promoting a program of awareness and opening discussions with adults on how to cope in a fire, before it happens and it is too late. Although Ruby and her family experience a bushfire, this book could be used to approach the topic of any sort of fire within any community. Bushfire is an inspiring book about a girl named Ruby and her beloved dog Gypsy, who get caught in life threatening fires. Through the book you follow Rudy on her emotional journey. You are with Ruby through the lose of her best friend, the adventure of making new friends and the building of a new life. I felt the heartache that Ruby felt when she found out her best friend had perished in the fires and I felt the warmth of the community spirit as they pulled together. I found this book enlightening, warming and heartfelt. Once I had finished reading I felt refreshed and close to Ruby. The book has made me more fire aware and I now feel ready if the time ever arises that I'm stuck in a fire. I found the book to lag in some places, but it was easy to pick up again as I was dying to find out what happened in the end. Elizabeth Mellor has done a wonderful job at writing a touching book. I would recommend it to anyone looking for an inspiring read of the journey of life after tragedy.